29 Jun - 29 Sep 2019 Daily, Mon-Sun from 08:30 a.m. to 3:30 p.m.
FREE admission for children under 10 years if accompanied by a paying parent. Groups of 10 to a maximum of 20 persons can enjoy free guided tours on the topic of glaciers and glacial phenomena if booked in advance. Please book at least one day in advance at our Eisgrat information office. Dogs are not allowed in the ice grotto - we ask for understanding. In the winter you get to the ice grotto by foot on a sign-posted winter hiking trail from the Eisgrat mountain station. We recommend sturdy boots. Follow the blue arrows at the main exit of the Eisgrat mountain station along piste 2 down to the ice grotto. With skis or snowboard you start best at the Eisgrat mountain station on piste 2 and take a left turn approx. 200m below the Eisgrat mountain station. In the summer you get to the ice grotto by foot in approx. 10 minutes on a hiking trail starting from the Eisgrat mountain station. We recommend sturdy boots. Unfortunately, the trail is not suitable for wheelchair users. Hidden in the glacial ice, the ice grotto near the Eisgrat station on the Stubai Glacier gives visitors a fascinating insight into the world of snow and ice. Dive into the world of the cool glacier ice on hot summer days. 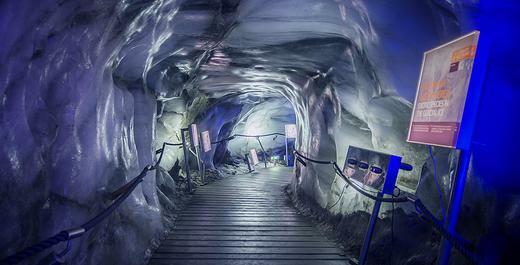 The new ice grotto on almost 3,000m makes it possible to experience intensive moments in the eternal ice. Experience the fascinating glacier world and learn amazing things about moraines, abrasions, glacier milk, different ice layers, alternating sequences, inclusion, glacier protection and a lot more. 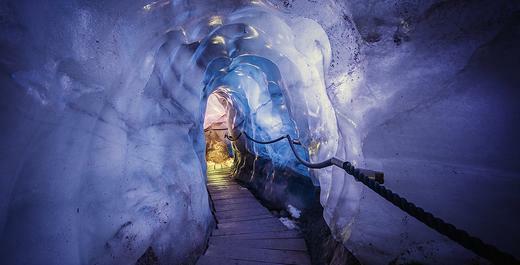 On a tour of the grotto glacier phenomena can be experienced first-hand and the eternal ice captivates its visitors. 30m below the ski piste is a 200m-long tour that is a breath-taking experience for the whole family. A throne made from ice serves as photo point as befits the kingdom of snow. An adventurous tour in the glacial ice awaits you! The Stubai Glacier, Austria’s largest glacial ski resort, is outstanding for its guaranteed snow cover. The ski resort comprises five of the 117 glaciers in the Stubai Alps. 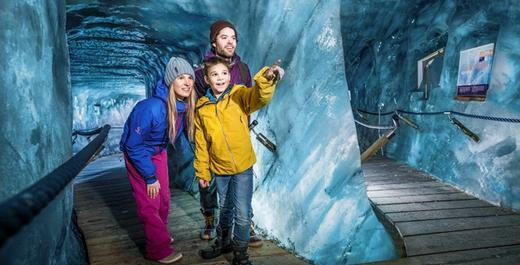 With the ice grotto at the Eisgrat mountain station, the “heart” of the Stubai Glacier can now be accessed and is a special experience for the whole family. Thanks to the surveying by the Technical University of Stuttgart headed by Prof. Dr.-Ing. Wolf-Ulrich Böttinger it is now possible to enjoy a 200m-long tour through the glacial ice. For the glacier not to take ecological harm, the project was scientifically and with great commitment accompanied by the Innsbruck glaciologist Dr. Andrea Fischer, who is known for her pioneering work for glacier protection in the project fleece covering. You can reach the ice grotto on an easily accessible wide path from Eisgrat mountain station. Please expect your visit to the ice grotto to take around an hour. A brief guide is intended to assist you and offer you detailed information. The stations are marked with numbers. You can find interesting information in this brochure under the same number. You can download the information folder here or pick it up at the cash desk at the entrance of the ice grotto. We hope that you can enjoy an interesting and adventurous tour of the Stubai Glacier ice grotto.